WAYNE GRETZKY appeared at seven major international tournaments for Canada; the Great One totaled 26 goals and 82 points in 55 games for Canada on the world stage. Anybody who knows even the first thing about hockey has heard of WAYNE GRETZKY, the most amazing player the game has ever produced. In an ironic twist of fate, for all the Stanley Cups and individual records achieved at the NHL level in addition to Canada Cup titles for his native land in international hockey — one award missing from Gretzky’s trophy cabinet would be an Olympic medal from the Winter Games. Gretzky lifted Lord Stanley’s Cup four times with the Edmonton Oilers during the 1980s and also was victorious at the Canada Cups of 1984, 1987 and 1991. The Great One garnered a bronze medal at the 1982 IIHF World Championships in Helsinki, as well. 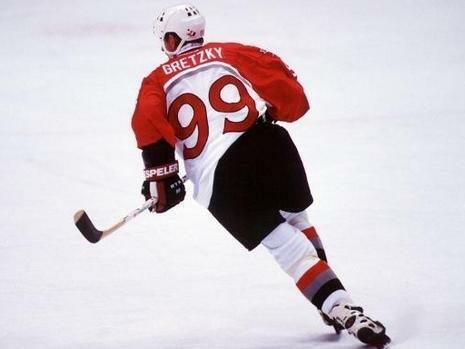 The National Hockey League’s decision to shut down temporarily so as to allow its players to compete at the 1998 Olympics in Nagano allowed Gretzky to realize the boyhood dream of skating for Canada at the Winter Games. Canada reached the semi-finals but ultimately lost to the Czech Republic in a penalty-shot shootout after overtime; Canadian Olympic coach MARC CRAWFORD drew criticism from some quarters as the aging Gretzky was not one of the shooters selected for his squad. Finland clipped Canada 3-2 in the Bronze Medal Match and, thus, the 37-year-old Gretzky, unfortunately, left Nagano empty-handed. On no less a stage than the semi-finals at the Nagano Games of 1998, Russian captain PAVEL BURE accomplished a feat that, amazingly enough, no player from the old Soviet powerhouse teams of the past had ever achieved. Five goals in an Olympic contest. Any questions with respect to why Bure was referred to as the Russian Rocket will find answers in the following footage of that game versus Finland in Japan; three of Bure’s five goals against Finnish goalie JARMO MYLLYS are the result of clean breakaways from center ice. The game itself is noteworthy, as well. After Bure had personally given Russia a 3-0 lead, it is the Finns who rally to pull even at three from TEEMU SELANNE. Finland again fall down a goal but are rescued by SAKU KOIVU before the Russians go ahead for good via the skate of ANDREI KOVALENKO. 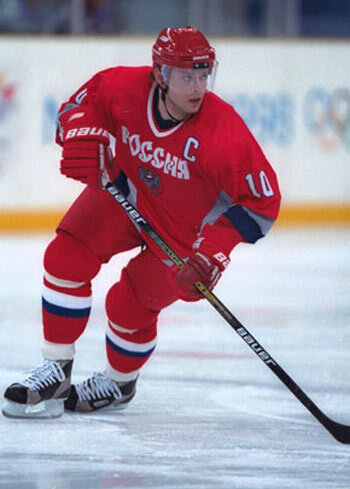 Bure, the Russian captain at Nagano, ended the 1998 Winter Olympics as tournament top shot with nine goals in six games. Czech Republic cage master DOMINIK HASEK turns aside a Russian shot as PAVEL BURE (10) lurks in the final Group B game of the round robin stage at the 1998 Winter Games from Nagano. Russia won this match, 2-1. With all due respect due other men who have minded the net such as JACK MCCARTAN and JIM CRAIG of the United States, not to mention VLADISLAV TRETIAK of the old Soviet Union, there is no question the greatest goaltending performance in the history of ice hockey at the Winter Olympic Games was offered up in Japan by the netminder known as “The Dominator”. As one might expect from a champion of champions, DOMINIK HASEK really stepped up his game once the tournament reached the knock-out stages. In the quarterfinal versus the United States, the Czech Republic fell behind 1-0 in the first period and would end up being outshot by the wide margin of 39-19 for the game. It was Hasek, however, who slammed the door shut with twenty-nine saves over the final two periods allowing his teammates the opportunity to rally for four goals and advancement. As for the Canadian team laden with National Hockey League stars including the legendary WAYNE GRETZKY, the Canucks only managed to put a puck past Hasek with their goaltender on the bench and sixty-three ticks on the clock. The Canadians did outshoot the Czechs 5-1 in the sudden-death overtime period. To close out the tournament in proper fashion, facing a squad with such world class players as PAVEL BURE and SERGEI FEDOROV on board, it was, in retrospect, a foregone conclusion that Hasek would successfully deal with all 20 Russian shots on goal to post a shutout and make a single goal for the Czech Republic stand up in the Gold Medal Match. Czech Republic goalie DOMINIK HASEK looks back after saving from Canada's THEO FLEURY, who started the shootout session of the sensational semi-final at the 1998 Winter Olympic Games in Nagano, Japan. For extreme viewing enjoyment, a 10 minute 41 second clip of the entire shootout from the 1998 Olympic ice hockey semi-final matching CANADA and the CZECH REPUBLIC. This footage from the game broadcast by the Canadian Broadcasting Company contains such intricate events as the coaching staffs for the two teams, led by MARC CRAWFORD of Canada and the late IVAN HLINKA of the Czech Republic, pondering and preparing the the official list of players to be involved in the shootout as well as the coin toss involving long-time National Hockey League referee BILL MCCREARY and the two captains, the Philadelphia Flyers’ ERIC LINDROS of Canada and one-time Boston Bruin VLADIMIR RUZICKA of the Czech Republic. Also interesting are the shots of Canada’s WAYNE GRETZKY on the bench before and during the shootout. Nagano marked the only appearance at the Winter Olympics for the Great One. The aging Gretzky, who won three Canada Cups on the international stage and grabbed a bronze at the 1982 IIHF World Championships in Finland, ultimately left Japan without an Olympic medal. Gretzky, who scored 23 goals (with 67 assists) in 82 games for the New York Rangers during the 1997-98 season, was not among the skaters selected by Canada for the shootout. Hasek’s most dramatic save has to be from Lindros in the fourth round. The Flyers’ captain, with a full head of steam, makes a move to his backhand and appears to have caught Hasek leaning a bit the wrong way with Canada running out of chances in the shootout round. Hasek, however, is able to get his goalstick down in the nick of time to just steer Lindros’ shot safely off the goalpost. Oddly enough, the Canadian captain is followed in the fourth round by the Czech Republic’s JAROMIR JAGR, another star skating in the National Hockey League for a Pennsylvania club at that time. The Pittsburgh Penquin also catches iron, though # 68 clanks the post straight off his forehand wrist shot. ROBERT REICHEL, the sole shooter to find the back of the net, scored 252 goals in 830 games for the Calgary Flames, New York Islanders, Phoenix Coyotes and Toronto Maple Leafs in 11 National Hockey League seasons. Reichel, 38, is still active in the Czech elite league for HC Litvinov, his hometown club. Dominik HASEK posted a 2.09 goals-against-average with 13 shutouts in 72 games for the Buffalo Sabres during the 1997-98 National Hockey League season.